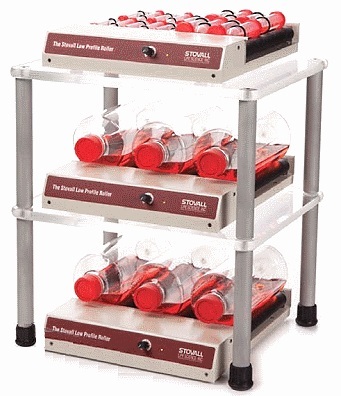 This low profile laboratory roller mixer provides a convenient fit into high humidity chambers, incubators, ovens, and refrigerated units without rearranging shelves or disturbing other materials. The height is only 2.3 inches. The variable speed control allows speeds of 2 – 38 rpm during use. 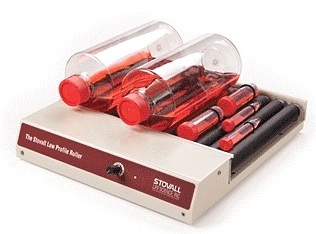 With its industrial grade drive train and chemical resistant finishes this low profile roller will provide many years of great service to a lab! Thin, flat power cord reaches external outlets without damaging gaskets of incubators or other chambers. Supplied with six rollers that can accommodate three large (850 cm) roller bottles. 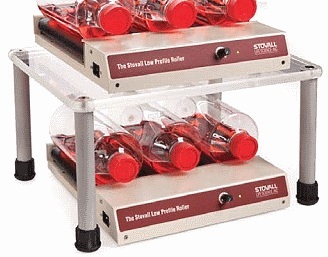 The rollers can be moved closer together for smaller bottles or tubes or for mixtures of bottle sizes. Up to five optional additional rollers can be inserted so that up to twenty 10 to 50 ml tubes can be rolled. ACCRL0001 Single Platform Stack, allows the use of two Low Profile Rollers within the footprint of one. Acrylic 18"×16" platform and 9" tall anodized aluminum legs. ACCRL0002 Double Platform Stack, allows the use of three Low Profile Rollers within the footprint of one. Acrylic 18"×16" platforms and 18.75 inches high.